The SQ5 is a very fast, well-equipped Q5, but not much more than that. It retains exceptional quality and comfort – and plenty of speed – but stops short of delivering outright thrills. It’s very good, but doesn’t feel as sharp to drive as Porsche’s Macan. Interested in buying an Audi SQ5? The recipe for the SQ5 is simple: take a regular Q5, and sport-ify it a bit. Into the mix come some chrome name badges, a more aggressive bodykit, and some fake exhausts at the back, but the overall look is typically Audi; understated and classy. 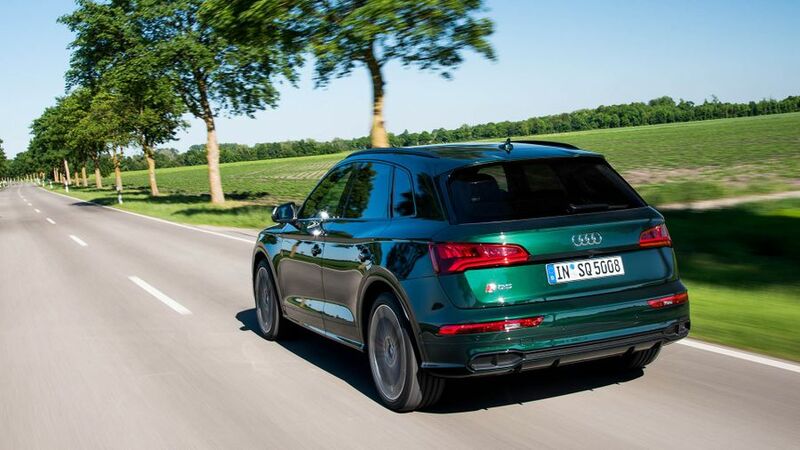 It comes as standard on 20-inch alloy wheels and sports suspension with adaptive dampers, which makes the car sit 30mm lower than the standard Q5. Air suspension is an option. Full LED lights are also standard front and back, as are aluminium-look exterior mirrors, which are something of an Audi hallmark for S-badged cars. Audi sets the benchmark for interior quality, and the SQ5 is no exception, with great quality of materials, screwed together superbly well. 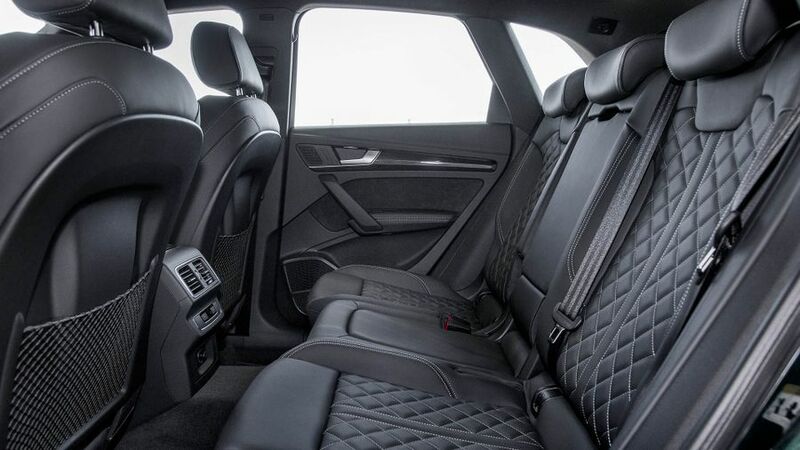 It’s almost identical to the standard Q5, albeit with a high level of standard specification and some extras thrown in. Supportive sports seats covered in diamond stitched Nappa leather are standard, and adjust electrically for your preferred driving position. Also included are matt-brushed aluminium trim inlays (or carbon fibre, if you want to splash out a bit). The shift paddles behind the steering wheel are aluminium, while the pedals are stainless steel. An 8.3-inch screen is the centrepiece of the infotainment system, which is controlled by a dial and touchpad that can read handwriting, too. It’s a super-slick system that’s easy to navigate. 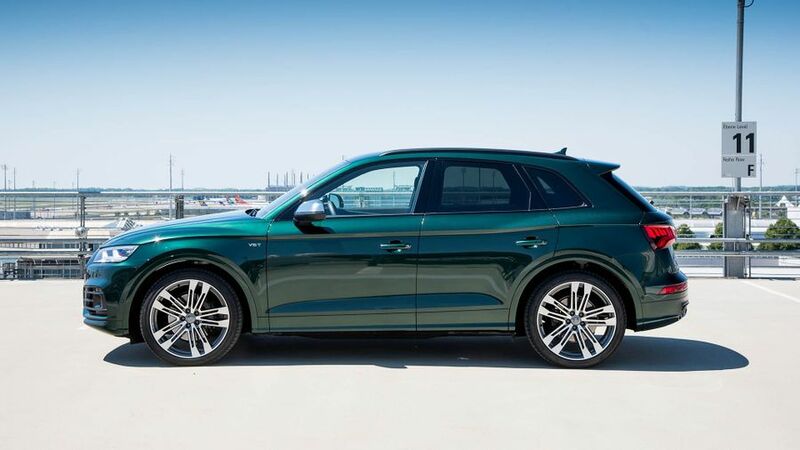 The addition of extra performance to the SQ5 hasn’t affected the practicality of the standard car, which is more than reasonable in this segment. There’s plenty of room for five adults inside, and the rear bench can move backwards or forwards to prioritise either leg-room or luggage space. Even at its smallest, the boot can hold 550 litres of stuff, which is slightly down on the Jaguar F-Pace but more than any of the Porsche Macan range. Drop the second row and the space widens to 1550 litres, but the seats don’t go completely flat. Cubby holes and cupholders are scattered around the cabin. It’s not the most practical SUV on sale, but it certainly doesn’t disgrace itself. The SQ5 comes with sports suspension springs with adaptive dampers as standard, but we’ve only had a chance to try the optional air suspension so far. It’s excellent, striking a superb balance between ride comfort, and keeping things stable around corners. The SQ5 changes direction superbly well, but the steering lacks weight and feedback, even with the car set to Dynamic mode. If you expect the S in the car’s name to deliver sportiness, you may be disappointed. Certainly compared to the Porsche Macan, which feels agile, alert and keen, the SQ5 is more reserved and neutral. It can whip round corners if you push it, but it doesn’t urge you to do so and doesn’t give too much excitement in return. Although a diesel version is on the way, there’s currently only one petrol engine available in the SQ5: a turbocharged 3.0-litre V6 with 349bhp. That’s more power than in most hot hatches, but the Q5 is considerably larger than a hatchback. We’re not saying it isn’t quick though; Audi’s famous Quattro all-wheel drive system means swift acceleration, and it’ll hit very high speeds, but there’s a lack of urgency in its delivery, and the downside to a superbly insulated cabin is a lack of drama even when the pace is high. Again, if you want excitement, dampen your expectations. But if you want quiet, refined, comfortable speed, this may well be up your street. The SQ5 costs slightly less to buy than the Jaguar F-Pace S and Porsche Macan GTS, and slightly more than the Macan S, but residual value estimates lag below those rivals. Servicing costs should be far lower than those for the Porsches, and fairly close to those of the Jaguar. 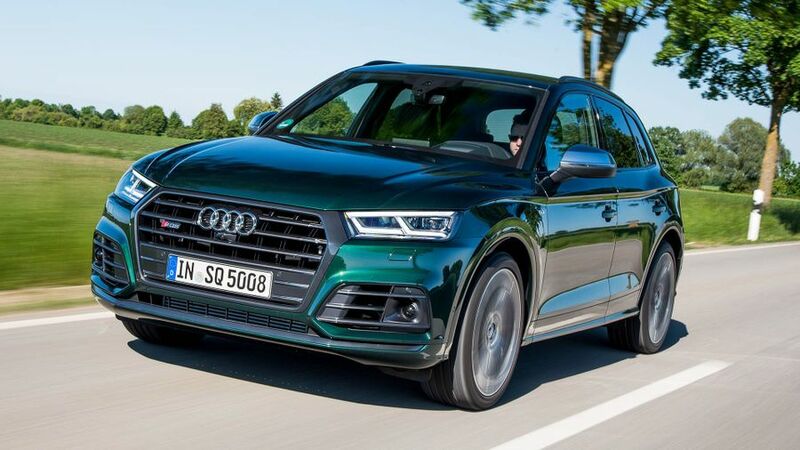 Unsurprisingly with a large, performance-focused petrol engine, fuel costs will be relatively high, but with an official combined mpg figure of 34.0, the SQ5 outperforms all rivals mentioned. Overall, based on a three year/60,000 mile period, we expect running costs to be slightly more than the Jaguar, and less than the Porsche Macan GTS. However, the Macan S’s very strong residuals mean it will be substantially cheaper to run than all three. We don’t yet have any data for the latest generation of Q5, let alone this new S version, but Audi will hope it performs much better than the previous generation. Warranty Direct’s Reliability Index makes painful reading for would-be Q5 owners, with rock bottom scores. Electrical gremlins and engine problems prove the biggest issues. Audi as a brand doesn’t fare much better, sitting firmly towards the bottom of the manufacturer rankings. However, results from our owner reviews were much more positive towards the last generation Q5 and the previous SQ5, with no reported problems. 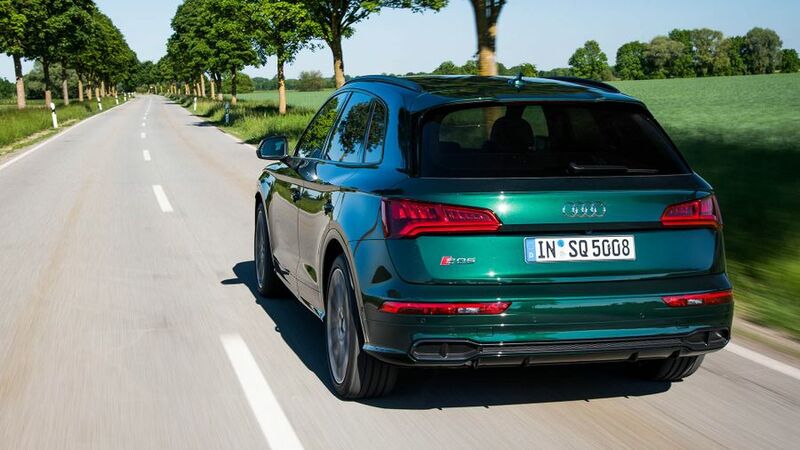 The standard Q5 scored the maximum five stars in crash tests by safety organisation Euro NCAP, and the SQ5 inherits that excellent performance. Automatic emergency braking is included as standard as part of a system that warns the driver of dangers posed by pedestrians and other vehicles. At this level, you’d expect six airbags and Isofix child seat fitting points, and you get them. But if you want rear side airbags and adaptive cruise control, you’ll have to pay extra. Audi’s Pre Sense system, which prepares the vehicle for an accident if it senses one impending, is also optional. The SQ5 is well specified, with plenty of kit as standard, but some of the cooler toys are found on the options list. All cars ride on 20-inch alloy wheels, with two designs of 21-inch rims available as options. LED headlights are upgradable to Matrix LED headlights, which monitor oncoming traffic and use high beam while putting other cars in shadow to avoid dazzling. They make a real difference when driving on unlit roads at night. A 10-speaker sound system is included, upgradable to an excellent Bang and Olufsen 3D system. Other options include a panoramic sunroof, a head-up display, and Audi’s Virtual Cockpit: a very impressive digital dashboard that replaces traditional analogue instruments. Many of these options can be specified in bundled packs. You want a cutting edge SUV with superb comfort and quality, and you want performance to go with it. You’re not overly concerned about adrenaline from the driving experience though: for that, you’ll want to head to a Porsche dealership. Treat the SQ5 as a speed upgrade from the standard Q5, rather than a genuinely entertaining vehicle, and you should be very pleased.